A handy little tool will take any tweet's URL and spit back MLA- and APA-style citations for it. 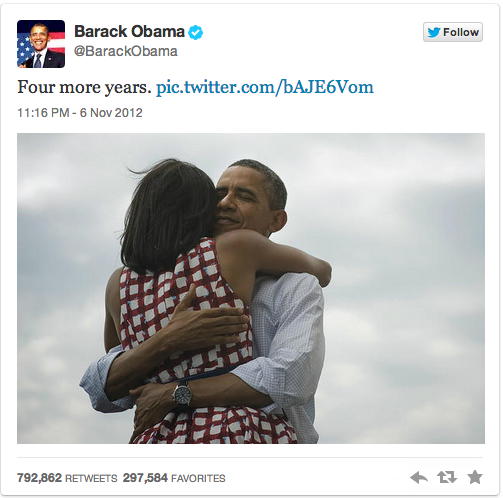 Say you're writing a paper on Twitter during the 2012 U.S. presidential election. How do you cite all those tweets you'll be referencing? Easy enough. But say you need to cite dozens or even hundreds of tweets. You're going to be pretty sick of all the ctrl-c/ctrl-v required to wrestle those tweets into the desired format. Thankfully, a web developer by the name of Ben Hedlund built Tweet2Cite.com, a free utility that can take the URL of any tweet, extract the requisite information, and, with one click, generate citations in the MLA format (and the APA format too, for the psychology students out there). Enter the URL for the famous election night tweet above, and in less than a second, you'll get these results, easily copy-and-pasteable into your text editor of choice. Hedlund says he had the idea for the tool while he was learning web development, and decided that "the best way to learn in this field was by doing." He thought the project was right for his skill-set, and would be useful to people to boot, "freeing up time for actual journalism and research," he says. And indeed it does.